MIAMI, Florida, June 25, 2012 (ENS) – Tropical Storm Debby gained strength Sunday as it struck the northeastern Gulf coast with high winds and heavy rain, but the storm is a little weaker Monday morning as it moves slowly toward the Florida coast, according to the National Hurricane Center. 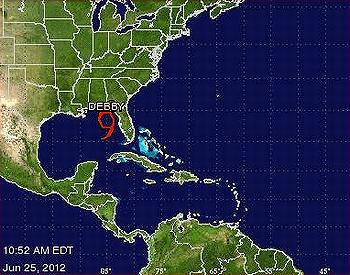 At 10am Monday, Debby was located about 75 miles south-southwest of Apalachicola, Florida. Debby is moving toward the northeast at three miles per hour and this slow motion is expected to continue for the next two days, the hurricane forecasters said. Maximum sustained winds have decreased to near 45 miles per hour; little change is expected in the next day or two, said forecasters. Tropical storm force winds extend outward 230 miles from the center of the storm, mainly to the southeast. Debby is projected to produce 10 to 20 inches of rain across much of northern and central Florida, with a local maximum of 25 inches possible, according to the National Hurricane Center. Storm total accumulations of five to 15 inches are possible across coastal southeastern Georgia and southeastern South Carolina, forecasters project. Tropical storm warnings are in effect along the Gulf Coast from Morgan City, Louisiana, to the mouth of the Suwanee River in northwest Florida. In Florida, Franklin County has issued a mandatory evacuation for Alligator Point, St. George Island and low lying areas. Power is out on St. George Island and officials warned it might not be restored for several days. Voluntary evacuations are in place for coastal and low lying areas in Taylor County and low lying and coastal areas south of US 98 in Wakulla County. Shelters are open Pinellas, Liberty, Bay, Taylor and Levy counties. The Skyway Bridge between Pinellas and Manatee counties is closed in both directions due to high winds. Several tornadoes moved through the area southeast of Tampa, damaging homes, the Highlands County sheriff’s office said. A woman was found dead in a house in Venus, Florida that was leveled by the storm. A child found in the same house was hospitalized, a sheriff’s spokesperson reported. Strong thunderstorms, flash flooding, and isolated tornadoes are possible and deteriorating coastal conditions are likely throughout the day, Florida emergency officials warn. The projected path of the 2012 hurricane season’s fourth named storm remains uncertain, but it Debby stays on its current course, the hurricane center projects southeastern Louisiana and neighboring Alabama will feel her lash when it comes ashore late this week. Debby is the earliest fourth named storm on record, with the previous record being held by Hurricane Dennis, which became the fourth storm of 2005 on July 5, according to the Federal Emergency Management Agency, FEMA. Rain, wind and tides could produce storm surges up to five feet in Louisiana, forecasters say. “The combination of a storm surge and the tide will cause normally dry areas near the coast to be flooded by rising waters,” the hurricane center warned. A government hurricane response team reports that as of Sunday, 23 percent of oil and gas production in the region had been suspended, and employees have been evacuated from 13 drilling rigs and 61 production platforms in the Gulf of Mexico.